The rapidly growing science of laser cutting is dominated by two main methods -- carbon dioxide (CO2) laser cutting and fiber laser cutting. Both processes offer increased precision and versatility for shops of all sizes, and the technology is continually evolving toward improved precision, easier use, and greater flexibility. Like any welding setup, though, the decision tree for finding the right automated laser cutting process starts with an evaluation of both your current applications, needs and limitations, and your long-term vision. Variables including the type and thickness of the material, accuracy, production rate, purchase budget, and operating costs are all important factors to consider. CO2 cutting is best for fine features and acute angles, and typically uses two axes and a moveable table to create the cut. It’s a fast process for materials less than ⅜ inches, but higher-powered machines work quickly on thicker metals, too. And, thanks to improvements in technology, quality and control, the CO2 laser delivers better cut edge quality than fiber on thicker surfaces. A CO2 laser can require an initial investment that’s anywhere from $350,000 to more than $1 million, a price tag that’s largely due to optical mirrors and consumables. From there, operating costs hover at around $20 an hour. Fiber laser cutting is a more recent technology and has grown dramatically in popularity, partly due to its superior quality when cutting thinner material. In fact, fiber laser sales have now outpaced those of CO2, but it isn’t a catch-all solution. Where CO2 cutting uses a focused light beam, fiber cutting uses a bank of diodes to create the beam, which is then focused through a fiber-optic cable. Cutting speeds are generally much faster with fiber, and the process yields fine cuts with precision quality. However, it does have a few big drawbacks – more intricate jobs may significantly reduce cutting speed, and it requires specific safety measures to prevent long-term eye damage. A fiber laser setup can be less expensive than CO2, ranging from $200,000 to $600,000. It also has significantly lower operational costs -- around $4 per hour -- because its solid-state setup doesn’t require the mirrors and other equipment needed for its CO2 counterpart. 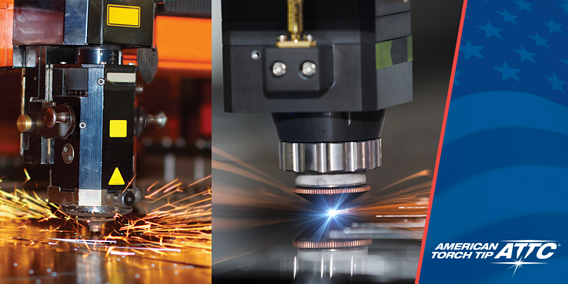 American Torch Tip offers a wide range of precision laser cutting parts at affordable prices. View our complete catalog or contact one of our experts for more information.